Finding Hidden Mickeys while visiting Disney World can be a fun activity. During a series of recent trips, finding the Hidden Mickey on the Tomorrowland Transportation Authority in the Magic Kingdom proved to be more difficult than expected. Hidden Mickeys are either a partial or complete image of Mickey Mouse that has been hidden by Disney's Imagineers within the design of an attraction, hotel, restaurant, shop, or elsewhere on the grounds of the Walt Disney World Resort. Steven M. Barrett is considered to be the expert on Hidden Mickeys and in his book "Hidden Mickeys A Field Guide To Walt Disney World's Best Kept Secrets" there is a listing for one Hidden Mickey on the Tomorrowland Transportation Authority, aka the TTA. To prove that you have really found a Hidden Mickey and properly identified it you need proof. What better proof is there than taking a picture of the Hidden Mickey on a digital camera. The trick comes when you are looking to capture a Hidden Mickey while on a moving ride in a semi-dark tunnel. Picture taking can be difficult and you only have a brief instant to find what you're looking for. This made the challenge all that more exciting. Steven even gave a clue in his book to look for the Hidden Mickey in the scene with the woman getting her hair done. Those of you familiar with riding the Tomorrowland Transportation Authority know that you can find this in the tunnel that goes into the Buzz Lightyear's Space Ranger Spin building. The first attempt did not go so well. The scene came up on me before I knew it and the camera setting resulted in a blurred picture. This was going to be a real challenge. The next time I had a chance to ride the TTA, I was better prepared and took a much clearer picture. Still there was no Hidden Mickey evident. I would have to wait until the next Disney World trip to continue the quest. This time, I think I have spotted what could be the Hidden Mickey on her belt buckle, but still wasn't 100% sure. It would take another visit on another day for another try. Now the Hidden Mickey is finally in view on the picture. She is wearing a belt buckle that is red with a black Mickey Mouse head and ears on it. If you look at the blown up image it becomes even more apparent. I have to give Steven M. Barrett credit for putting together a great book that helps you locate most of the over 700 identified Hidden Mickeys at the Walt Disney World Resort. This particular one was quite challenging due to the fact that you could only see it briefly from a moving ride vehicle in a semi-dark area. Getting a clear picture was another challenge altogether. I would strongly encourage you to pick up Steven's book and conduct your own quest for Hidden Mickeys. 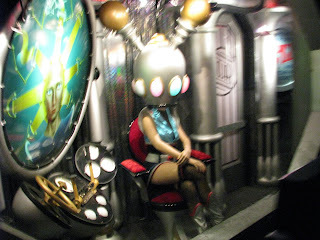 0 comments to "Finding The Hidden Mickeys On The Tomorrowland Transportation Authority (TTA)"